To read more about our adoptable special needs cats please go to our Adopt Page. Please donate whatever you can. Every penny will be used to help our special cats live a happy, comfortable life, whether in a new home or here at SNAP Cats. Thank you. 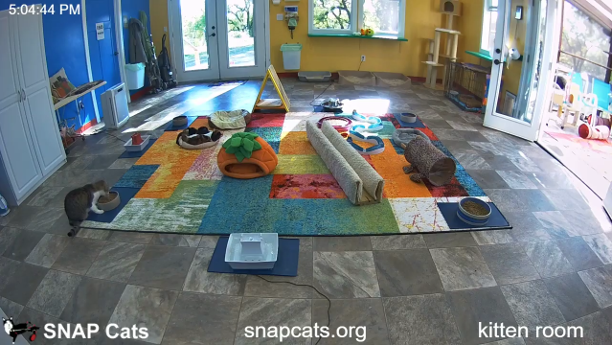 Whether you’re searching for your next kitty or just feeding your kitten room addiction, this live cam runs 24/7 so you won’t miss a thing. Click here for all of our webcam set-ups. SNAP Wraps are the stylish way to keep your special needs kitty dry and happy, while keeping your home clean and odor free. Our diapers are extremely absorbent, waterproof and machine washable, while our ACCESSORIES are light, durable and easy to clean. No more ugly disposables and snail trails on your floors. SNAP Wraps© are the smart and economical solution for you and your special needs kitty. Animal shelters around the world are full. The first cats to be killed are special needs, elderly and those deemed “unadoptable.” That’s unacceptable.